Infrastructure Malta has been ordered to halt ongoing EU-funded roadworks in a protected area close to Buskett after it emerged that no environmental permit had been applied for, the Environment Resources Authority told The Sunday Times of Malta. Sources said that the environment watchdog only became aware of the matter and intervened following a tip-off from the public. Established a few months ago, Infrastructure Malta, a State agency, has already made headlines for the wrong reasons twice so far, when it carried out works without a permit in Tal-Balal Road and in Ħal Farruġ to widen a traffic junction. 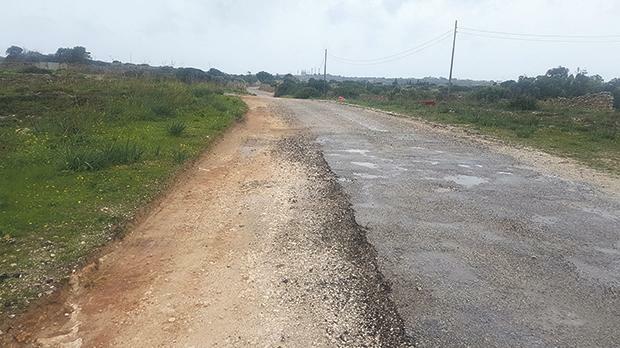 The works in question on the outskirts of Malta’s only developed woodland started some weeks ago along a 1.1 kilometre stretch of a rural road linking Triq il-Buskett to the area known as Il-Girgenti, on the outskirts of Siġġiewi. Sources said that the alarm bells were sounded amid suspicions that the road was being widened beyond its existing footprint onto adjacent protected land. An onsite visit by this newspaper suggested that in certain parts, scarifying works to remove the existing layer of asphalt were too close for comfort. However, a spokesman for Infrastructure Malta denied this was the case. He noted that this €405,000 project was part of an €11 million budget financed by the European Agricultural Fund for Rural Development to upgrade 40 kilometres of country roads by the middle of next year. In this case, the works consisted of trenching for water mains, new foundations and resurfacing. As for the permit, the agency said that works were being carried out in accordance with the “applicable roadworks permit”. Nonetheless the spokesman acknowledged that after the commencement of works, the ERA had requested a method statement, outlining the kind of intervention being made to ensure that no harm was done to the environment. “In spite of the fact that the project includes no interventions outside the existing road footprint, Infrastructure Malta stopped the works and provided the required information,” the spokesman said. “It will continue to consult the Authority to ensure that, weather permitting, these road resurfacing works can be completed as soon as possible,” he added. However, this version of events did not tally completely with the reply received from the ERA. A spokesman for the latter remarked that the authority had “halted the works as interventions in this area require to be carried out only once an ERA permit is obtained”. This go-ahead was required in view of the fact that the area around Buskett is a protected and sensitive zone. “Any planned interventions first needed to be assessed by ERA to ensure the least possible impact on the environment,” the spokesman said. He added that method statements were discussed with the authority until the type and method of intervention would be considered acceptable. “This document will form part of the permit and any deviation from the agreed method statement would be considered an infringement of the permit,” ERA said. However, the spokesman pointed out that the permit application was still being processed.